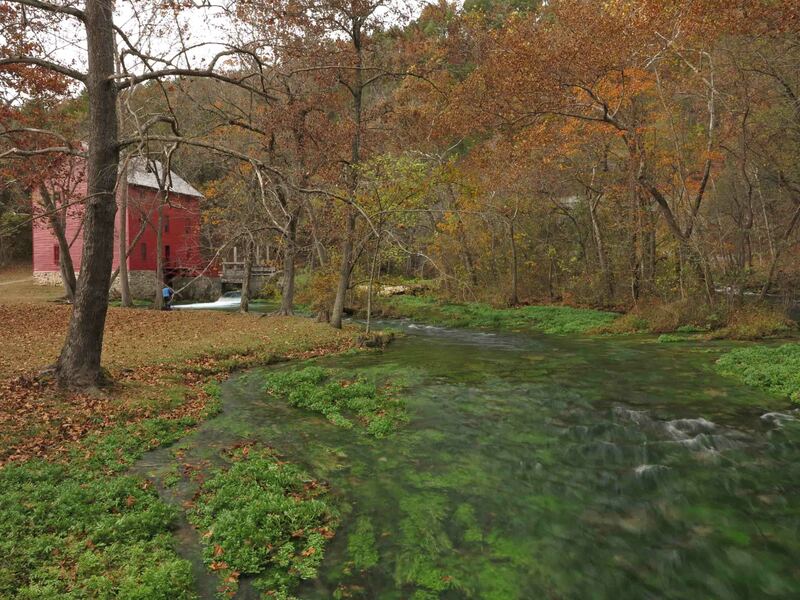 While researching possible trails in the Jacks Fork and Current River area of Missouri, I almost dismissed Alley Spring because of its shortness at only 1.9 miles. 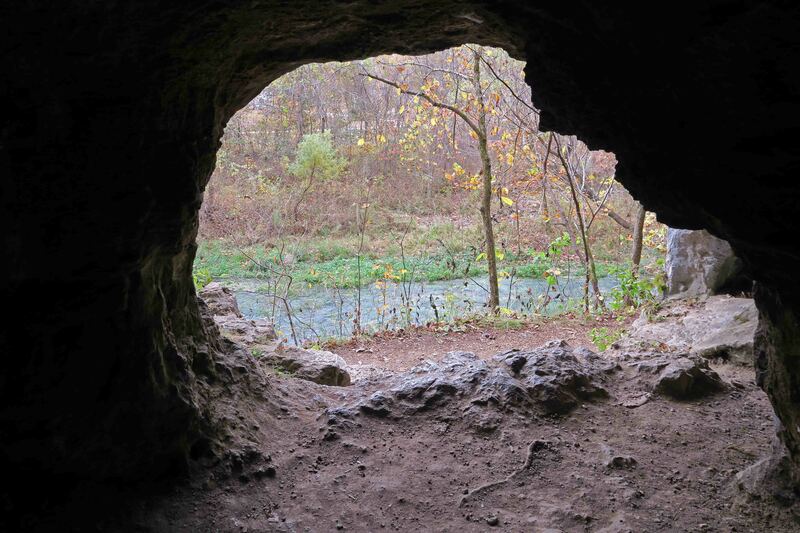 As I stepped onto the trail beginning behind the mill, I realized what a mistake that would have been. 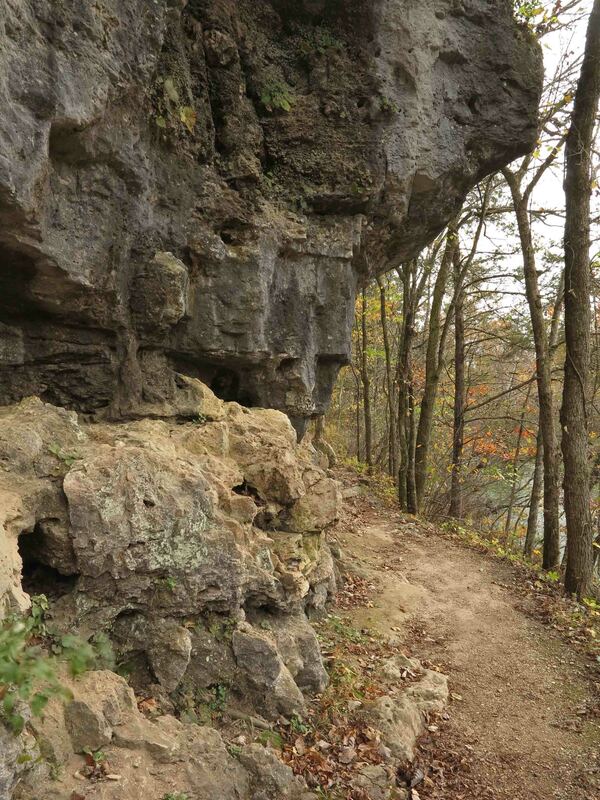 The trail is well built and scenic every step of the way. 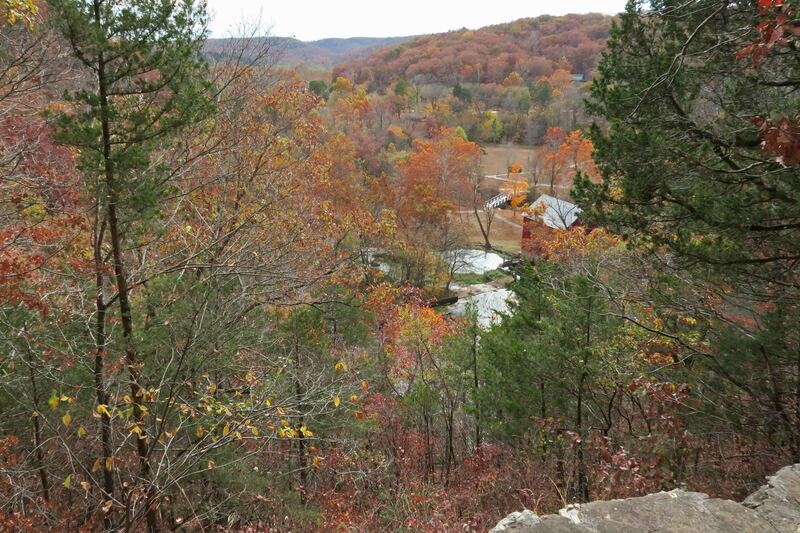 The trail takes you to an overlook on a ridge behind the mill. 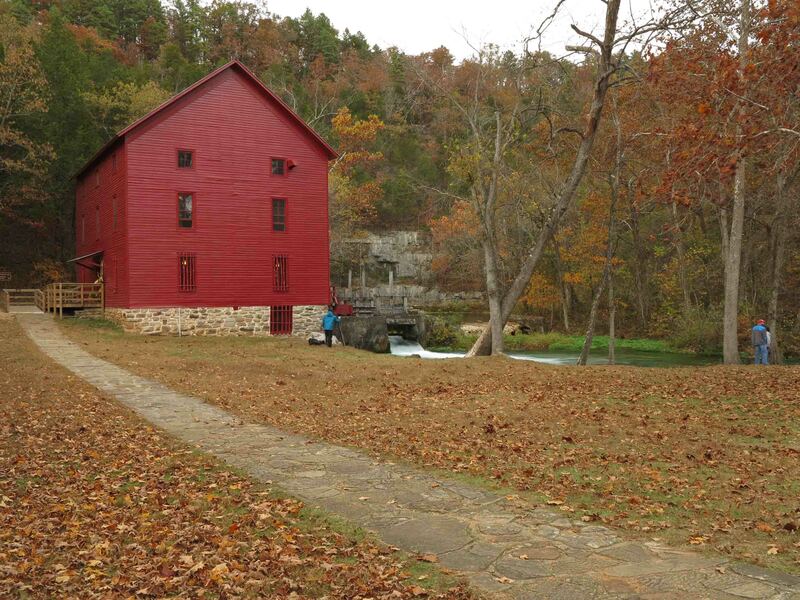 You can see the spring, mill, and foot bridge approaching the mill. After switchbacking down to the mill’s level, a section of the trail follows a narrow dirt road shared by a horse trail. 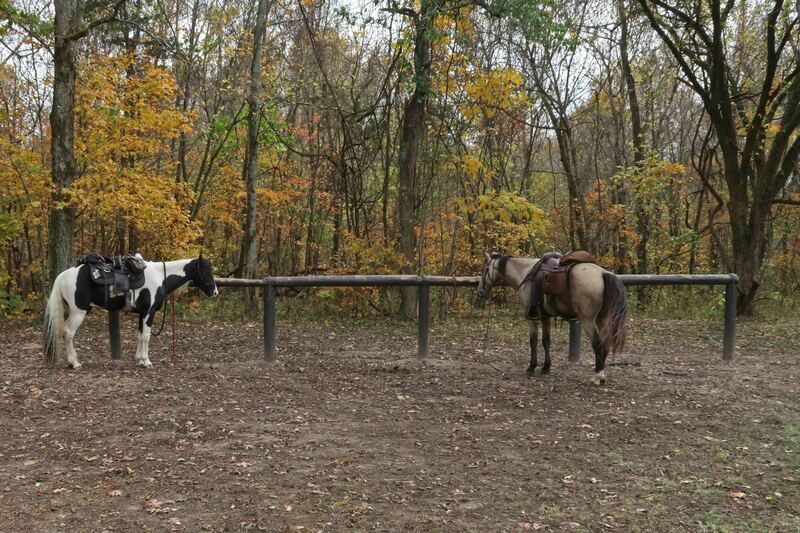 The trail passes between two horse hitching posts before beginning to follow Alley Branch upstream. The trail then follows Alley Branch upstream next passing a couple of interesting little bluffs populated with indentions and caves, suitable homes for everything from cliff swallows to small mammals. I found one about the size of a tent and crawled inside for a look. Alley Branch flows away from Alley Spring. The water is clear and cold. 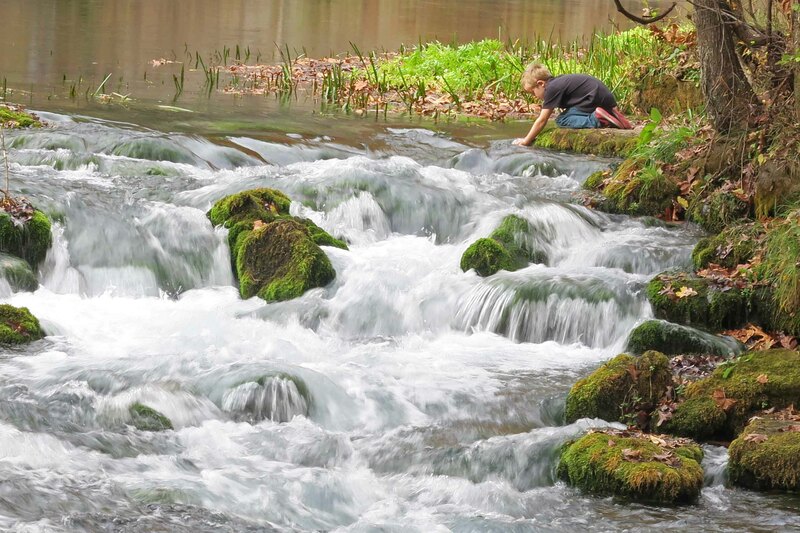 A young man walking the trail with his grandmother stooped over and took a drink of the clear water. I was a little envious of his lack of caution and still regret not scooping up a sip myself. 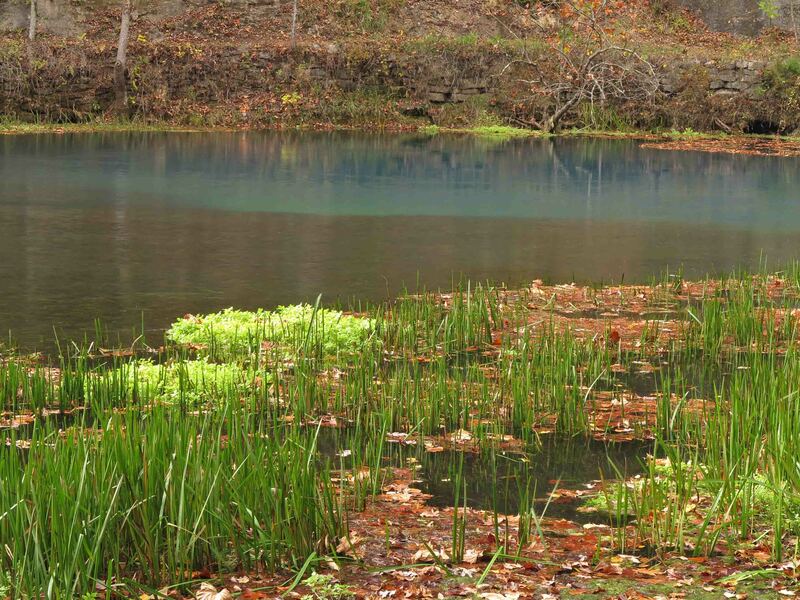 Shortly after passing the small cascade, the trail wraps around the deep, blue spring that pours out over 80-million gallons of water per day. 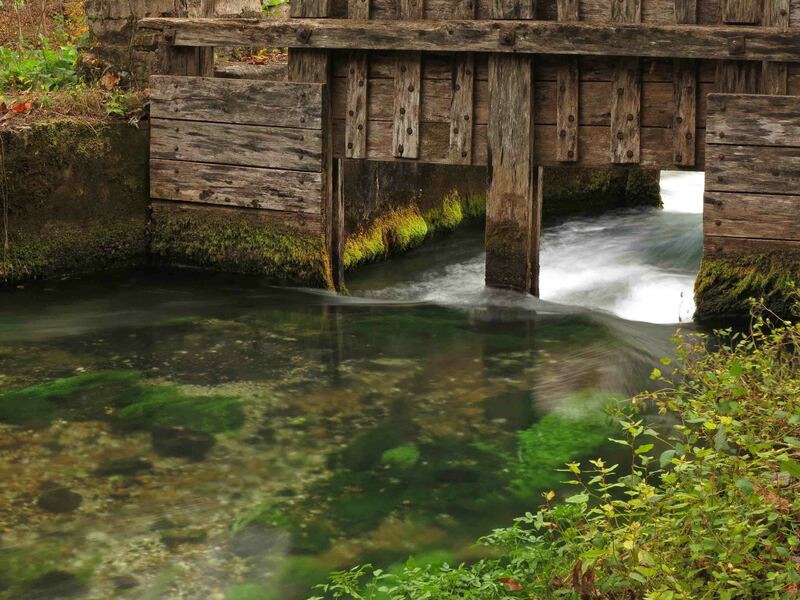 The trail then comes back to the mill house, passing water gates that adjusted the flow of water. These gates in front of the turbine pit allowed some control over the speed of the mill, making turbine mills superior to waterwheel mills. Before heading back to the parking lot, I spent some time just looking back on the mill and relaxing in the cool October air. Alley Spring would a great place to spend a whole day. A picnic area and restrooms are located close to the parking lot. 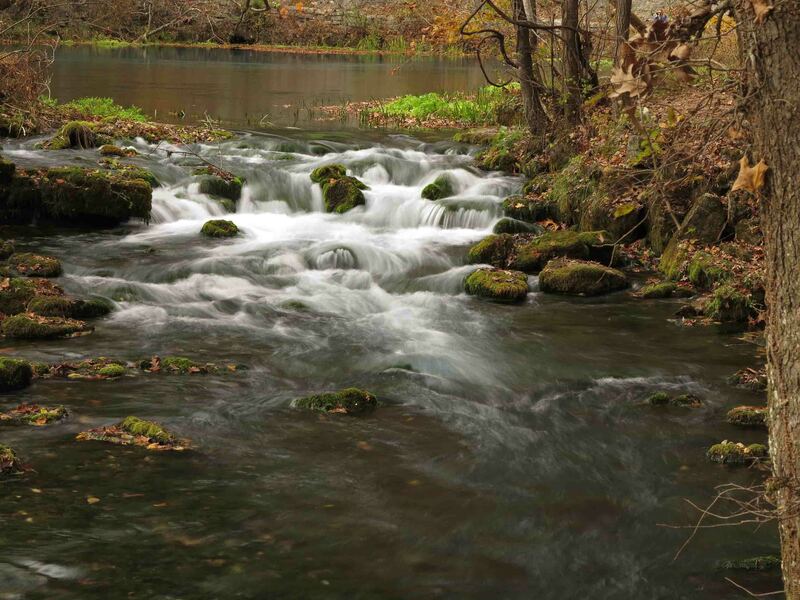 A campground next to Jacks Fork River is located close by. Hiker-dog and I slept there under a tarp to rest for the next day and more trails. The following morning, after hiking the Alley Spring trail a second time before dawn, Hiker-dog and I drove six miles east to the little town of Eminence. I was surprised to find a restaurant open at 6:15 a.m. and stopped for some breakfast. Turned out to be a real find! Ruby’s Family Restaurant served up a real breakfast and kept the coffee topped off. I struck up a conversation with the only other customer. The elderly man had grown up in Alley Spring and was a delight to visit with. He attended school in a one-room schoolhouse located right next to Alley Spring and walked just over a mile to school each day. After hiking the Rocky Falls area that morning, I returned to Ruby’s for lunch and met Ruby, the owner. I mentioned my conversation with the gentlemen that morning. Without hesitation she told me his name and said he could share a lot of history about Eminence and Alley Spring. 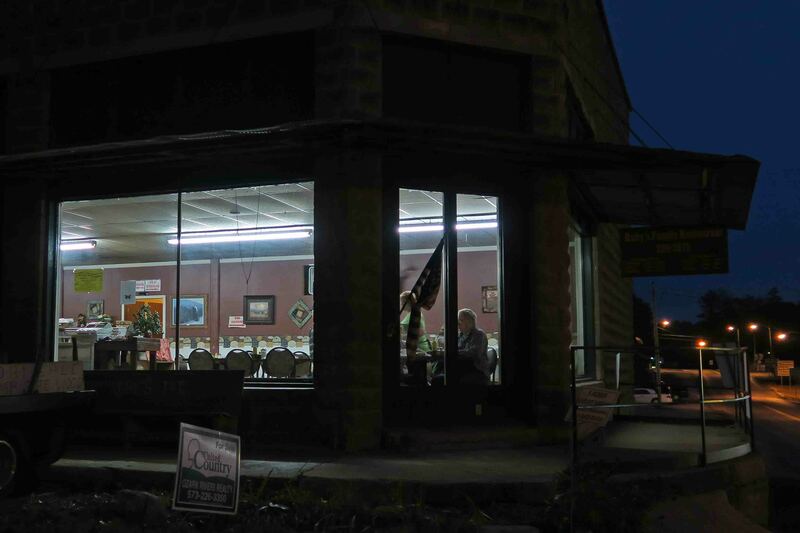 I look forward to eating at Ruby’s and seeing Alley Spring Mill again someday. I might even run into Pete Ward, the resident historian again. Ruby’s Family Restaurant on my first visit. Ruby’s Family Restaurant after a late lunch. 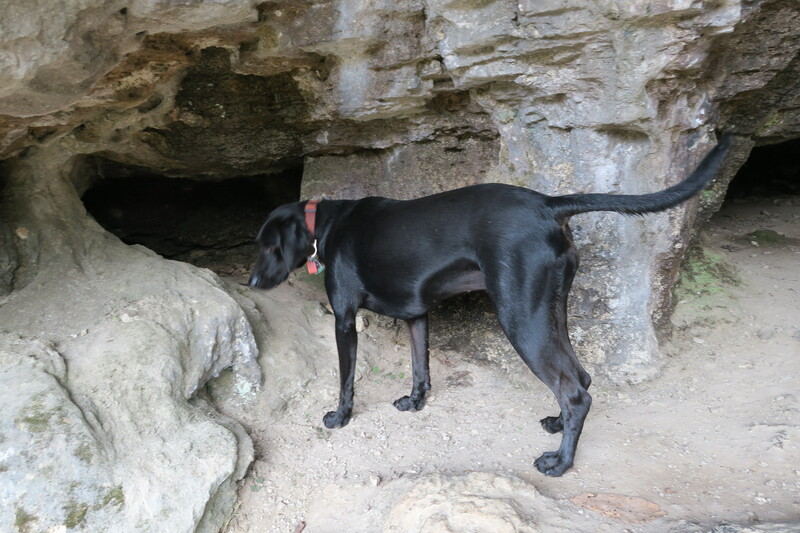 Hiker-dog enjoyed exploring small caves in the bluffs next to Alley Branch. 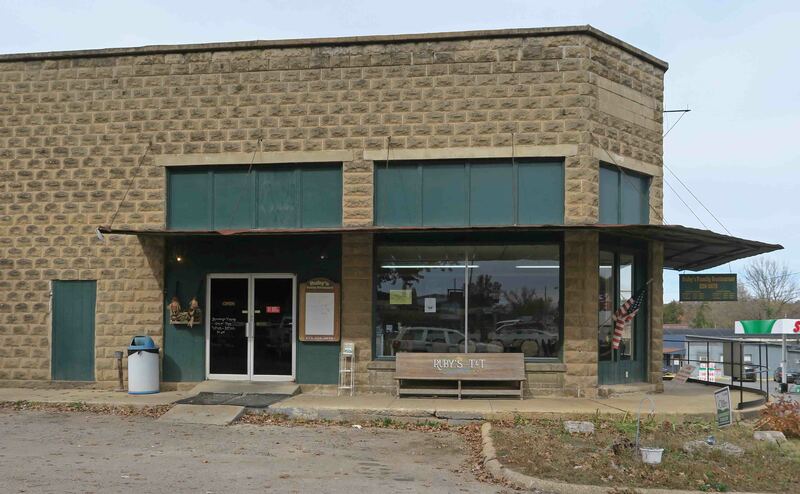 This entry was tagged Alley Branch, Alley Springs, Alley Springs Mill, Current River, Eminence Missouri, Jacks Fork River, Missouri Ozarks, Ruby's Family Restaurant, turbine mill. Bookmark the permalink. Now you are in my special stomping grounds in Missouri. You mentioned Rocky Falls; the history there fascinates me. 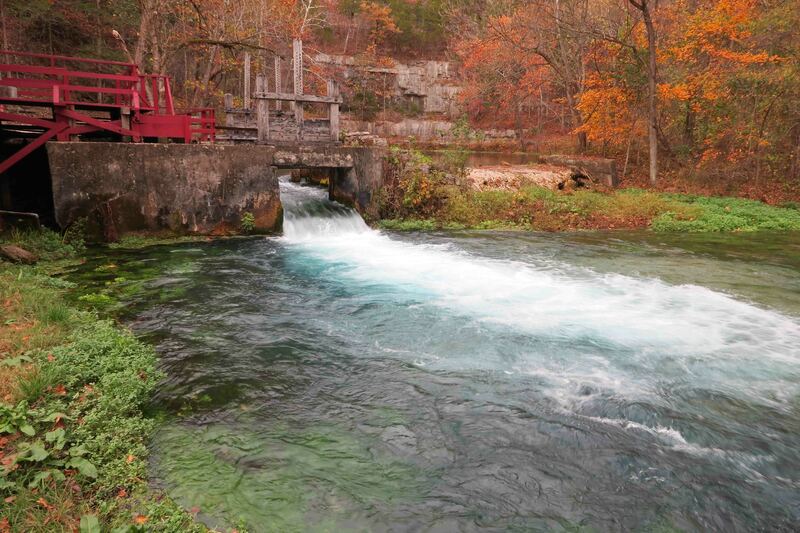 South of there by Alton, MO is Greer Springs, the mecca of the Missouri Ozark mountains. I’m sure you have been there. I am so enjoying your travels. Great to hear from you. While hiking and camping this area, I felt an unmistakable pull toward Springfield and the Walnut Street Inn. 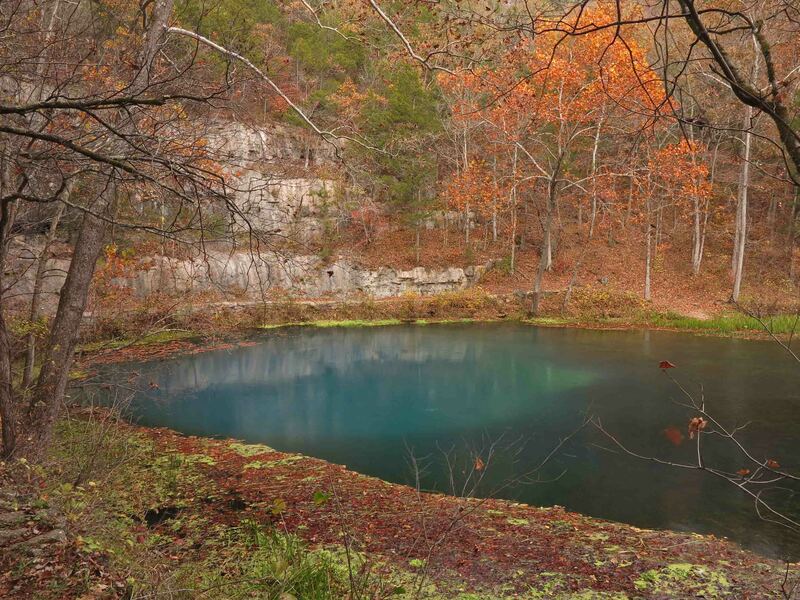 Looking forward to scheduling a visit when I head farther north on my Missouri explorations. Thanks for reading and sharing. I’m very interested in your “trailer life” and am wondering if you are glad of your choice of trailer, or suffering a bit of post purchase cognitive dissidence?